Aquatic plants have many unique biological features and are potential for its agricultural, nutraceutical and medicinal importances. Many plant species under aquatic origin were reported to have valuable folklore utilization in traditional medicine. The genus Nymphoides is one of the most ubiquitous floating-leaved groups, belonging to Menyanthaceae family of aquatic and wetland plants and it has about 50 species globally. The name Nymphoides refers to be similar to the water lily Nymphaea. The plant species under Nymphoides consist of roots under water and floating leaves holding the small flowers above the water surface. This aquatic genus is extensively distributed worldwide in the tropical and temperate regions. Among them, few species of Nymphoides namely Nymphoides indica (N. indica), Nymphoides peltata (N. peltata), Nymphoides hydrophylla (N. hydrophylla) and Nymphoides macrospermum (N. macrospermum) are available in the southern region of the Asian continent. These species are known to be involved in a multi medicinal usage locally. According to ethnobotanical reports, these aquatic herbs are traditionally used for the treatment of injuries, snake bites, jaundice, dysentery, convulsion etc. as well as constituent of a well-known ayurvedic drug formulation, e.g. Tagara,. The phytochemical constituents of the Nymphoides species are found to be comprised of various lipophilic compounds, flavonoids, β-sitosterol, salicylic acid, tannic acids etc,. Literature reviews revealed different pharmacological studies including antimicrobial, antidiabetic, antiprotozoal, antioxidant, cytotoxic, anti-proliferative etc. on this aquatic species. In Asia, many of the indigenous aquatic plants of the genus Nymphoides are extensively used in traditional medicine, and various research works were done to investigate their bioactivity and their phytochemical constituent till now. The present article reviews those medicinal values of this aquatic genus Nymphoides to highlight the significance and the importance of such floating plant species as ethnomedicines. According to the ethnobotanical study, there is a huge multicultural history which was documented in Asia to cure different diseases by using the herbal extracts of the Nymphoides species..
N. indica (Linn.) O. Kuntze, the most well-known species for the local healers of Bangladesh, India and Nepal, which is provided as a general tonic in replacement of chiretta (Swertia chirayita) for the symptomatic treatment and also for the management of jaundice, dysentery and fever,,. In South Orissa, N. indica is known to cure a bilious headache, scabies, rheumatism by the external application of the raw leaf paste and also the sesame oil soaked whole dried plant. The juice obtained from the leaves and roots of N. indica was used as a component of an oral herbal formulation with other plant extracts, i.e. Achyranthes aspera and Piper nigrum prepared by the Bagdi tribal healer of Rajbari District, Bangladesh for the treatment of common ailments, such as tonsillitis to relief pain. N. hydrophylla (Lour.) O. Kuntze is another common species of Nymphoides native in Bangladesh, India, Bhutan, and Cambodia. The plant is frequently used as a substitute of chiretta (Swertia chirayita) in the treatment of fever and jaundice. Dried powder of stalks and leaves are mixed with different herbal oil formulation and applied in various skin ulcers and insect bite. The fresh leaf paste is considered as an antidote for scorpion sting and snake bite. The decoction of stalk and leaf is used externally as an antiseptic and also used as a cleanser for the management of parasitic skin infections. The raw fluid of the leaf is applied superficially in various ophthalmic diseases. Seed powder of the plant is known to be orally administered with honey as an anthelmintic drug,. N. peltata (Gmel.) O. Kuntze is also the popular floating plant native to the temperate regions of Europe, Asia and the Mediterranean region. In India, the plant is considered as medicinally important mostly in Kashmir wetlands, where it is therapeutically administered as an anthelmintic, diuretic and febrifuge and also reported to be used in the treatment of burns, fevers, ulcers, snake bites and swellings. The fresh leaves paste is used in the treatment of habitual headache like migraine, migrainous neuralgia, etc. It is also administered during pregnancy as galactagogue to promote lactation. N. macrospermum Vasudevan is the renowned Nymphoides species in Ayurvedic medicine which is used to treat various chronic diseases like epilepsy, anemia, jaundice, tuberculosis, etc. And it is commonly used as a substitute of Valeriana jatamansi Jones in the ayurvedic drug Tagara that is known to minimize the severity of convulsions,. Nymphoides species are constituent of Tagara which is one of the most reputed ayurvedic drug formulation, it is generally regarded as brain tonic. It is also commonly used in Unani medicine, Asarun (Asarum) and in various pharmaceutical preparations for the treatment of brain and nervous system disorder, like migraine, insomnia, anxiety, epilepsy. Nymphoides species are also known to cure anaemia, jaundice and asthmatic conditions. However, the most established source of Tagara is Valeriana jatamansi (Valerianaceae), and to some extent, due to their inconvenient sources, i.e. Himalayas and another drug ‘Granthika Tagara’ from South India consisting of N. macrospermam, started being used as Tagara in several therapeutic preparations. Granthika Tagara is a combination of numerous available Nymphoides species, like N. macrospermam, N. hydrophylla, N. indica, Nymphoides aurnaticum and Nymphoides parvifolium, etc. found in different parts of India,. Herbal drugs have been invariably used in various traditional medicines for the treatment and management of epilepsy, due to the avoidance of the associated side effects and dependency development which was caused by prolonged use of other prescribed synthetic drugs. Therefore, researchers are now very curious in discovering drugs from the natural sources and studying their pharmacological properties regarding anticonvulsant activities. N. indica and N. macrospermum showed anticonvulsant activities and found to possess the same mechanism as benzodiazepines, phenobarbitone, felbamate, etc., by inducing the delayed onset and discontinuation of seizures and the rapid recovery without any toxicity report after consumption. N. indica is known to be effective against petitmal and grandmal type of epilepsy, which is confirmed by investigating the anticonvulsant effect using aqueous and alcohol extract of their roots and rhizomes by maximum electroshock convulsion and pentylenetetrazole induced convulsion methods in Swiss albino mice. The results indicated that the extracts of N. indica at the dose level of 300 mg/kg and 600 mg/kg exhibited significant anticonvulsant activity against both maximum electroshock convulsion induced and pentylenetetrazole induced convulsion models. N. macrospermum was also reported to be effective against the petitmal type of epilepsy and it was found that the alcohol extract of N. macrospermum at doses of 500 mg/kg and 750 mg/kg bodyweight, extremely diminished the severity and increased the latency of convulsions in the pentylenetetrazole induced seizure model. Due to these excellent pharmacological properties, N. indica and N. macrospermum plant species are considered as a probable source of Tagara to establish their use as a substitute for V. jatamansi. Antiepileptics are generally consumed with other anxiolytic drugs. As majority of antiepileptic drugs have to be consumed constantly, concomitant administration of other drugs induces the risk of drug interaction. By considering these factors, researchers are now interested in compounds from plant origin for developing anxiolytic drugs with minor side effects. Recently, there are many reports of traditional drugs exhibiting good hypnotic and sedative effects with few side effects. N. macrospermum is considered as the potential source of such traditional drugs formulation, e.g. Tagara. It has the antiepileptics properties and was found to provide sedative effect investigated by a significant reduction in locomotor activity in Swiss albino mice which was studied by using an actophotometer. The alcohol extract of N. macrospermum up to a dose of 750 mg/kg body weight caused central nervous system depression which was indicated by a reduction in locomotor activity without inducing any toxicity, therefore it is reported that it has no acquired side effect,. Medicinal plants have always been recognized as a potential source of natural antioxidants from an ancient period of times. Among Nymphoides species, N. hydrophylla and N. indica are reported to have antioxidant property. N. indica is claimed to possess moderate antioxidant activity. Recent study indicated that the ethyl acetate extract of N. indica leaf fractions presented better antioxidant potential (IC50 81 μg/mL) determined by 2,2-diphenyl-1-picrylhydrazyl (DPPH) scavenging activity. There are numerous studies for determining the antioxidant activity in terms of its aqueous, ethanolic and methanolic extracts of N. hydrophylla. According to the literatures, it can be suggested that the ethanolic extract of N. hydrophylla has significant antioxidant activity compared to other extracts. In that study, the ethanolic extract of N. hydrophylla was tested by using four types of antioxidant methods, DPPH free radicals scavenging activity, reducing power method, nitric oxide assay and phosphomolybdenum method against standard gallic acid. According to the result, N. hydrophylla extract showed effective scavenging abilities against the free radicals by acting as hydrogen donors to scavenge DPPH free radicals with IC50 values of 6.35 μg/mL, by increasing the reductive power resulting the increase in the absorbance of the reaction mixture by the plant extract in a linear manner, and also by scavenging of nitric oxide radical with IC50 values of 432 μg/mL causing decreased amount of nitrite generation. The comparative study of the ethanolic and aqueous extract of N. hydrophylla were performed in another study, where it was found that the ethanolic extract exhibited higher antioxidant activities than the aqueous extract in the anti-lipid peroxidation, reducing power, metal chelation, and 2,2-azino-bis (3-ethylbenthiazoline-6-sulfonic acid) or ABTS radical scavenging assays, whereas the aqueous extract possessed more potent activity in the superoxide and DPPH radical scavenging assays. The crude methanolic extract of N. hydrophylla was also examined in another study for possible antioxidant activity, where the total phenolic content in leaves of N. hydrophylla extract was found to be 12.5 mg of gallic acid equivalent (GAE)/g of extract indicating the moderate antioxidant activity. Plant extract having antioxidant activities also leads to the inhibition of oxidative damage to a targeted tissue. Considering such antioxidant potential, the in vivo hepatoprotective effect of N. hydrophylla was measured against the carbon tetrachloride (CCl4) induced liver injury in albino rats. According to this study, it was demonstrated that the ethanolic whole plant extract of N. hydrophylla reduced the increased levels of biochemical parameters, like serum glutamate pyruvate transaminase, serum glutamate oxaloacetate transaminase, alkaline phosphatase and bilirubin, etc. As indicated in CCl4 induced hepatotoxicity and following histopathological studies, it was reported that the ethanolic extract (500 mg/kg) of N. hydrophylla produced impressive hepatoprotective activity without any necrosis and sinusoidal dilatations resembling to the standard ‘Silymarin’ group. Simultaneous treatment of ethanolic extract with CCl4 was found to produce lower hepatic damage in contrast to the animals treated with CCl4 alone which caused hepatotoxicities, like macro and micro vesicular fatty infiltration, necrosis, sinusoidal dilatation and congestion of central vein etc. It was suggested that the possible mechanism of such hepatoprotective action exhibited by N. hydrophylla could be the lipid peroxidation inhibition and free radicals scavenging effects. Cytotoxic screening of plants is the preliminary method that seems to be capable of detecting natural anticarcinogenic agents present in crude extracts. According to the literature, the leaf of N. hydrophylla was found to be cytotoxic which was investigated by using brine shrimp lethality bioassay, where the result showed that the crude methanolic extract of leaves of N. hydrophylla had significant cytotoxic activity with LC50 values found to be 3.28 μg/mL as compared to the standard vincristine sulphate with LC50 value 0.84 μg/mL. Through performing this general bioassay, it can be considered that such valuable species of Nymphoides genus can be the potential source of anticancer compounds,. Most antitumor drugs are generally encountered through plant-derived compounds or their derivatives. Currently, few Nymphoides species are accounted for its antitumor activity. Among them, N. peltata, the common wetland plant, exhibited significant antitumor activity in MTT assay by using 10% H2O-methanol (MeOH) extract of N. peltata against the human prostate cancer cell PC3 and the human osteosarcoma cell U2OS with IC50 values of 40.8 μg/mL and 70.7 μg/mL, respectively, where PC3 cells showed more sensitivity to the extract. Based on the phytochemical study, the proposed antitumor effect of N. peltata extract is thought to be due to the presence of the four major antitumor constituents, i.e. ephedrine, ephedradine C, 4-hydroxycoumarin and delta-1- dehydrotanshinone. The aqueous extract of N. indica was also reported to have higher anti-proliferative activity on HeLa cell line. Diabetes is a serious complication attributed to several metabolic disorders. A literature review revealed that N. indica leaf extract and its isolated constituents possessed mild to moderate antidiabetic property, which was experimented through in vitro antidiabetic assays, i.e. antiglycation assay and α -glucosidase inhibitory activity. Following antiglycation assay, it was observed that the crude extract of N. indica presented mild to moderate inhibitory activity at 100 μg/mL (33%), among which 90% methanolic extract exhibited most promising activity. Such antiglycation potential by the tested extracts showed moderate (24%-36%) inhibition of the formation of advanced glycation end products. Considering α -glucosidase inhibitory activity, a mild inhibition was observed for the total extract at 834 μg/mL (13%), whereas the highest inhibition was shown by 90% methanol (31%) and n-butanol fractions (25%) at the same concentration. The isolated seco-iridoid glucosides, monoterpenoids, phenolic acids and flavonoids from different fractions of N. indica extracts showed moderate activity towards antiglycation and inhibitory potential against the enzyme like α -glucosidase. Aquatic medicinal plants have always been considered as potential sources for investigating antimicrobial properties which are intended for the new drug development. The antimicrobial effects of such aquatic N. indica species were reported to be carried out through in vitro antimicrobial assay in an integrated screening panel. In this study, it was observed that the n-hexane fraction of N. indica leaf extract showed the highest levels of antimicrobial and antifungal activities with an IC50 of 19.5 μg/mL against Staphylococcus aureus and 32 μg/mL against Microsporum canis, and it was claimed that the isolated lipophilic constituents from that n-hexane fraction showed moderate antimicrobial activities among which the isolated compound, azelaic acid was highly active against Staphylococcus aureus with an IC50 value of 55.1 μM (11.2 μΜ for erythromycin). The 90% methanolic fraction of N. indica extract was also found to be active (IC50 36.4 pg/mL) against Staphylococcus aureus[6\. There are numerous medicinal plants known to be used as potent antiparasitic agent which are still under investigation for the development of novel antiparasitic drug. Nymphoides species are reported to have various antiparasitic properties, like antiprotozoal, antimalarial and anthelmintic, etc. An experiment reported that the isolated lipophilic constituents and the flavonoid i.e. 3, 7-Di- O-methyl quercetin-4′-O-ß-glucoside from N. indica leaf extract showed antiprotozoal activities against Trypanosoma brucei (IC50 8 μΜ), Leishmania infantum (IC50 32 μΜ) and Trypanosoma cruzi (IC50 30 μΜ). Azelaic acid, the lipophilic compound isolated from N. indica leaf extract also showed weak antiplasmodial activity against Plasmodium falciparum K1. The crude methanolic leaf extracts of N. hydrophylla is reported to exhibit significant anthelmintic property against Pheritima posthuma earthworm in a dose-dependent manner, where the results were expressed in terms of time for paralysis and time for death of worms. According to the result, the extract exhibited maximum efficacy at a concentration of 80 mg/mL compared to the standard piperazine citrate at dose of 15 mg/mL demonstrating the mild anthelmintic activity of N. hydrophlla. Preliminary phytochemical screening of Nymphoides species revealed the presence of many bioactive components, like flavonoids, tannins, saponins, triterpenes, carbohydrates, glycosides, phenolic compounds, phytosterols, volatile oil, coumarins, fixed oils and fats, steroids and sugars from different alcohol and aqueous extracts of N. hydrophylla, N. indica and N. macrospermum. In N. indica, the total flavonoid content of the crude extract was found 70.28 mg RUE/g extract, similarly the total phenolic content was 28.88 mg of GAE/g. In N. hydrophylla, the total polyphenolic compounds was found (1.110 ± 0.318) mg/g and (1.800 ± 0.350) mg/g in both aqueous and alcohol extract, respectively,,. 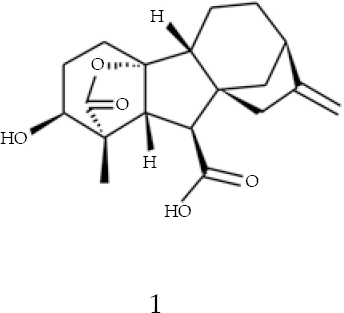 β-sitosterol (1), betulinic acid (2), salicylic acid (3) and tannic acid (4) were reported for the first time from N. hydrophylla [Figure 1]. A triterpenoid compound, β-sitosterol was reported to be identified and isolated in the alcohol extract of roots and rhizomes of N. hydrophylla. The percentage yield of the isolated β-sitosterol was found 24% and the melting point was 136 °C-137 °C. However, no structure elucidation of that isolated β-sitosterol was reported in this study. 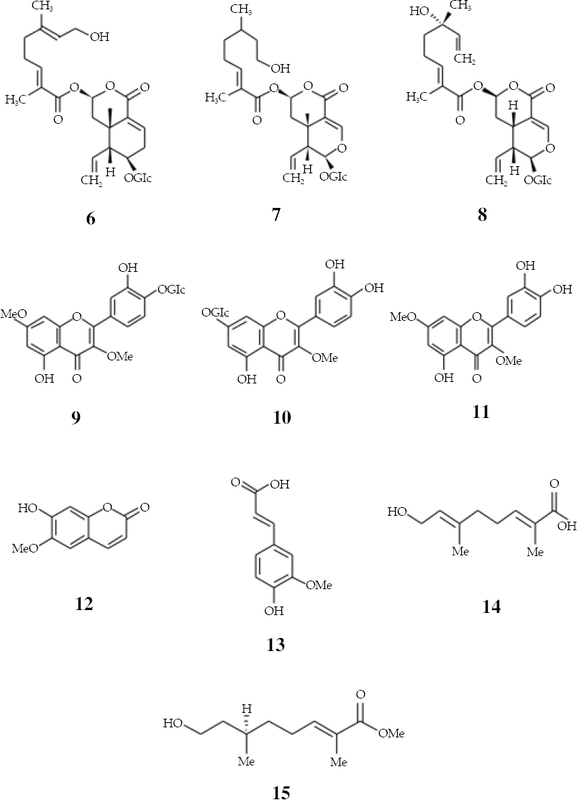 Figure 1: Identified phenolic compounds from N. hydrophylla. β-sitosterol (1), betulinic acid (2), salicylic acid (3) and tannic acid (4). According to the literature, these compounds are considered as the major active ingredients that are rarely reported from wetland plant N. peltata and other Nymphoides genus. Gibberellins were also reported to be detected from the endophytic fungus Aspergillus clavatus isolated from the roots of N. peltata [Figure 3]. Based upon quantitative assay using gas chromatography-mass spectrometry- selected ion monitoring analysis of the culture filtrate of Aspergillus clavatus Y2H0002 strain, three bioactive gibberellins (GAs: GA1, GA3 and GA4) were detected and quantified considering the physiologically active hormones. Literature search showed that four major antitumor constituents including ephedrine (1), ephedradine C (2), the organic amines, 4-hydroxy-coumarin (3), the benzopyrone compound and delta-1-dehydrotanshinone (4) were identified from the 10% H2O-MeOH extract of N. peltata [Figure 2] through HPLC and quadruple time-of-flight mass spectrometry analysis combined with the Agilent TCM database, METLIN database, and spectral data of standard compounds. Figure 2: Antitumor constituents detected from N. peltata. Ephedrine (1), ephedradine C (2), the organic amines, 4-hydroxy-coumarin (3), benzopyrone compound and delta-1-dehydrotanshinone (4). Figure 3: Gibberellins detected from endophyte A. clavatus isolated from the N. peltata. 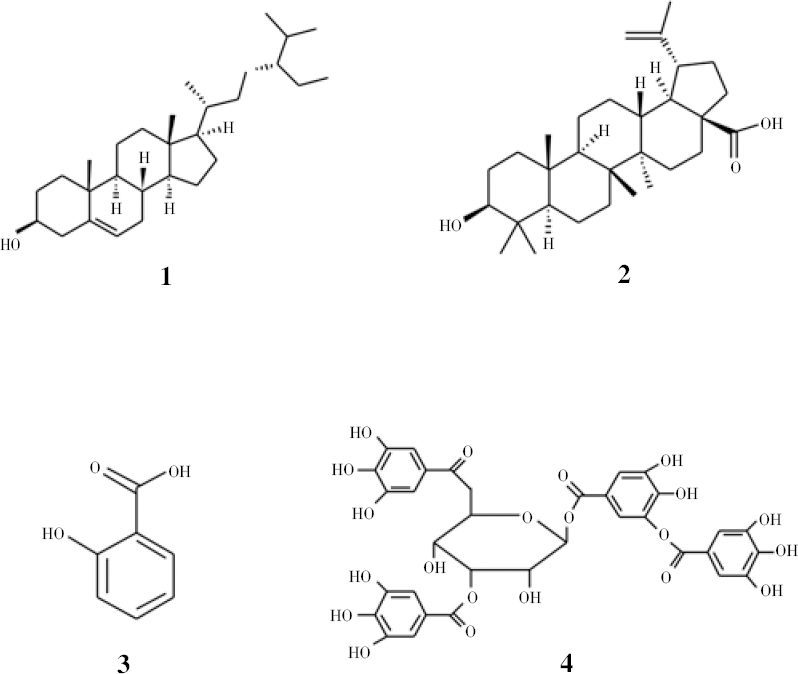 Phytochemical investigation of the n-hexane fraction leaves of N. indica species claimed 5 lipophilic constituents [Figure 4] identified as azelaic acid (1), hexadecanoic acid (2), 4-methyl-heptanedioic acid (3), hexadecanol (4) and stearic acid (5) based on 1H- and 13C-NMR spectral analysis and GC-MS analysis. Figure 4: Identified lipophilic constituents from N. indica. 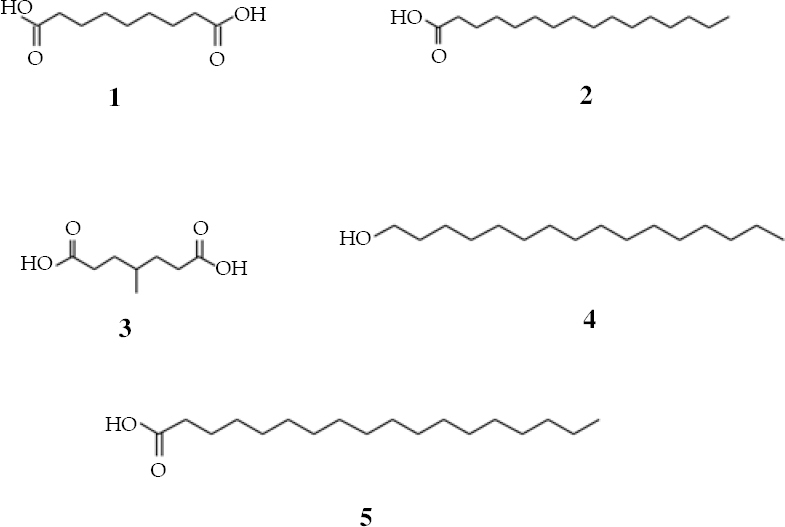 Azelaic acid (1), hexadecanoic acid (2), 4-methyl-heptanedioic acid (3), hexadecanol (4) and stearic acid (5). For the isolation of pure compounds, semi-preparative HPLC-DAD-MS system was followed and structure elucidation was done for the remaining compounds (6-15) by 1D- and 2D- NMR spectroscopic methods [Figure 5]. Among them, three seco-iridoid glucosides (6–8) and three flavonoids (9-11) were reported to be isolated and identified as 7-Epiexaltoside (6), 6”,7”-Dihydro-7-epiexaltoside (7), menthiafolin (8) and 3,7-di-O-methylquercetin-4′-O-ß-glucoside (9), 3-O-methyl quercetin-7-O-ß-glucoside (10) and 3,7-di-O-methy lquercetin (11). Finally, the phenolic coumarin, hydroxycinnamic acid, monoterpenoid and ester were also reported to be isolated and identified as scopoletin (12), ferulic acid (13), 8-hydroxy-2,6-dimethyl-(2E,6E)-octadienoic acid or foliamenthoic acid (14) and 6,7-dihydrofoliamenthoic acid methyl ester (15) respectively. Figure 5: Isolated compounds from N. indica. 7-Epiexaltoside (6), 6″,7″-Dihydro-7-epiexaltoside (7), Menthiafolin (8) and 3,7-di-O-methylquercetin-4′-O-β-glucoside (9), 3-O-methyl quercetin-7-O-β-glucoside (10) and 3,7-di-O-methy lquercetin (11). Finally, the phenolic coumarin, hydroxycinnamic acid, monoterpenoid and ester were also reported to be isolated and identified as scopoletin (12), ferulic acid (13), 8-hydroxy-2,6-dimethyl-(2E,6E)-octadienoic acid or foliamenthoic acid (14) and 6,7-dihydrofoliamenthoic acid methyl ester (15). There is limited information documented about the risk of Nymphoides species. According to the literature, motor neuron impairment was reported for N. macrospermum as a side effect of its anticonvulsant activity. In Asia, Nymphoides species are very popular phytomedicine for the local healers. Huge pharmacological studies have been carried out regarding different species of Nymphoides. Among all medicinal properties of Nymphoides species, their anticonvulsant property is very important for establishing ayurvedic drug, i.e. Tagara. The phytochemical screening and the reported pharmacological activities of different Nymphoides species suggested the presence of valuable bioactive compounds. Therefore, extensive research should be necessary in the area of isolation and characterization of the compound from that medicinally renowned plant species of Nymphoides for the purpose of new drug development. ZRK gratefully acknowledges BCSIR for awarding Prof. Mafiz Uddin Ahmed Smrity Fellowship and also sincerely appreciate Pharmaceutical Sciences Research Division, BCSIR Laboratories, Dhaka for the technical support. Zhang Y, Xu HL, Chen H, Wang F, Huai HY. Diversity of wetland plants used traditionally in China: A literature review. J Ethnobiol Ethnomed 2014; 10(72): 1-18. Tippery NP, Les DH. Phylogenetic relationships and morphological evolution in Nymphoides (Menyanthaceae). Syst Botany 2011; 36(4): 1101-1113. Sivarajan VV, Chaw SM, Joseph KT. Seed coat micromorphology of Indian species of Nymphoides (Menyanthaceae). Bot Bull Academia Sinica 1989; 30: 275-283. Jain A, Roshnibala S, Kanjilal PB, Singh RS, Singh HB. Aquatic/semiaquatic plants used in herbal remedies in the wetlands of Manipur, Northeastern India. Indian J Tradit Know 2007; 6(2): 346-351. Das NJ, Saikia SP, Sarkar S, Devi K. Medicinal plants of district North-Kamrup district of Assam used in primary healthcare system. Indian J Tradit Know 2006; 5(4): 489-493. Amin A, Tuenter E, Exarchou V, Upadhyay A, Cos P, Maes L, et al. Phytochemical and pharmacological investigations on Nymphoides indica leaf extracts. Phytother Res 2016; 30: 1624-1633. Madhavan V, Jayashree M, Yoganarasimhan SN, Gurudeva M, Deveswaran R, Mythreyi R. Pharmacognostical studies on the root and rhizome of Nymphoides hydrophylla (Linn.) O. Kuntze - An alternate source for Tagara drug. Indian J Nat Prod Resour 2012; 3(3): 371-385. Deka N, Devi N. Aquatic angiosperm of BTC area, Assam, with reference to their traditional uses. Asian J Plant Sci Res 2015; 5(5): 9-13. Shankar R, Rawat MS, Deb S, Sharma BK. Jaundice and its traditional cure in Arunachal pradesh. J Pharm Sci Innov 2012; 1(3): 93-97. Das NJ, Saikia SP, Sarkar S, Devi K. Medicinal plants of North-Kamrup district of Assam used in primary healthcare system. Indian J Tradit Know 2006; 5(4): 489-493. Panda A, Misra MK. Ethnomedicinal survey of some wetland plants of South Orissa and their conservation. Indian J Tradit Know 2011; 10(2): 296-303. Mukti M, Rahmatullah M. Treatment with aquatic plants by a Bagdi tribal healer of Rajbari district, Bangladesh. Anc Sci Life 2013; 33(1): 22-26. Swapna MM, Prakashkumar R, Anoop KP, Manju CN, Rajith NP. A review on the medicinal and edible aspects of aquatic and wetland plants of India. J Med Plants Res 2011; 5(33): 7163-7176. Abubakr A, Nahvi A, Kundangar MRD. Ecological studies and uses of valued aquatic plants in Kashmir wetlands. Nat Environ Pollu Tech 2011; 10(1): 115-118. Khare CP. Indian medicinal plants - An illustrated dictionary. New York: Springer; 2007. Fathima SN, Vasudevamurthy S, Rajkumar N. A review on phytoextracts with antiepileptic property. J Pharm Sci Res 2015; 7(11): 994-1003. Jayashree M, Khan MAM, Madhavan V, Murali A. Sedative and antiepileptic activity studies on two alternate sources of Tagara. Spatula DD 2015; 5(3): 139-146. Ayyathan DM, Chandrasekaran R, Thiagarajan K. Neuroprotective effect of Tagara, an ayurvedic drug against methyl mercury induced oxidative stress using rat brain mitochondrial fractions. BMC Complem Altern M 2015; 15(268):1-8. Kumar S, Madaan R, Bansal G, Jamwal A, Sharma A. Plants and plant products with potential anticonvulsant activity - A review. Phcog Commn 2012; 2(1): 3-99. Madhavan V, Arora S, Murali A, Yoganarasimhan SN. Anti-convulsant activity of aqueous and alcohol extracts of roots and rhizomes of Nymphoides indica (L.) O. Kuntze, in Swiss Albino mice. J Nat Remedies 2009; 9(1): 68-73. Murali A, Sudha C, Madhavan V, Yoganarasimhan SN. Anticonvulsant and sedative activity of Tagara (Nymphoides macrospermum). Pharm Biol 2007; 45(5): 407-410. Rout SK, Kar DM. Sedative, anxiolytic and anticonvulsant effects of different extracts from the leaves of Ipomoea Carnea in experimental Animals. Int J Drug Dev Res 2013; 5(2): 232-243. Bharathi R, Shankar KR, Geetha K. In vitro antioxidant activity and in vivo hepatoprotective activity of ethanolic whole plant extract of Nymphoides hydrophylla in CCl4 induced liver damage in albino rats. Int J Res Ayurveda Pharm 2014; 5(6): 667-672. Ko HJ, Huang SH, Ng LT. Chemical compositions and antioxidant activities of a specialty aquatic vegetable Nymphoides hydrophylla in Taiwan. J Aquatic Food Product Technology 2014; 23(6): 591-600. Moghal MMR, Foysal KA, Haque MM, Kader MA , Hossain MS, Mogumder S. In vitro study of cytotoxic, anthelmintic and antioxidant activities of Nymphoides hydrophylla. Int J Pharm Phytopharmacol Res 2013; 2(5): 328-331. 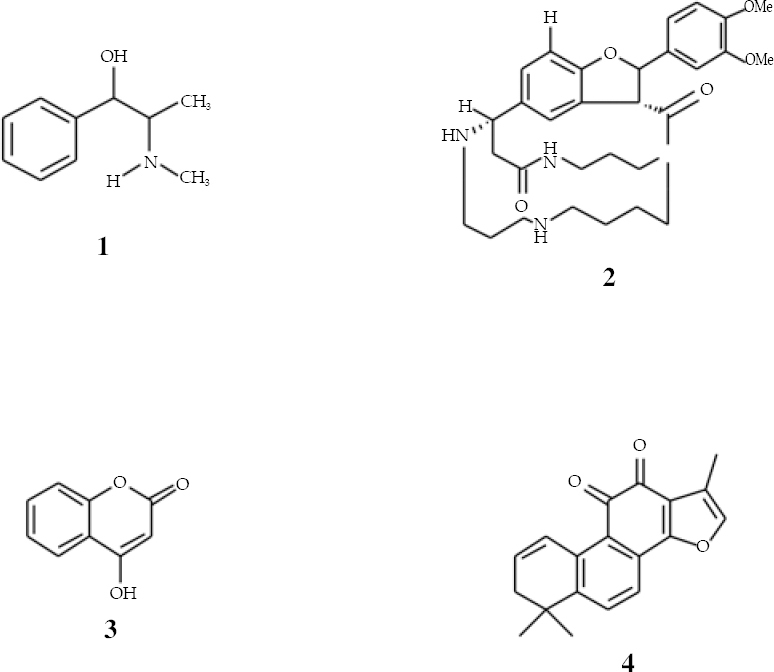 Nemati F, Dehpouri AA, Eslami B, Mahdavi V, Mirzanejad S. Cytotoxic properties of some medicinal plant extracts from mazandaran, Iran. Iran Red Crescent Med J 2013; 15(11): 1-4. Dua Y, Wanga R, Zhanga H, Liu J. Antitumor constituents of the wetland plant Nymphoides peltata: A case study for the potential utilization of constructed wetland plant resources. Nat Prod Commun 2014; 10(2): 233-236. Manosroi J, Boonpisuttinant K, Manosroi W, Manosroi A. Antiproliferative activities on HeLa cancer cell line of Thai medicinal plant recipes selected from MANOSROI II database. J Ethnopharmacol 2012; 142(2): 422-431. Rossi CC, Aguilar AP, Diaz MA, Ribon AO. Aquatic plants as potential sources of antimicrobial compounds active against bovine mastitis pathogens. Afr J Biotechnol 2011; 10(41): 8023-8030. You YH, Kwak TW, Kang SM, Lee MC, Kim JG. Aspergillus clavatus Y2H0002 as a new endophytic fungal strain producing gibberellins isolated from Nymphoides peltata in fresh water. Mycobiology 2015; 43(1): 87-91.